Fred Gooder Hatfield was born in Dewsbury on the 20 September 1896, and baptised at St Matthew’s Church, West Town, Dewsbury on the 14th October 1896. His mother’s name, Emma Hatfield, is the only name on the baptism registration. A year later, on the 25th September 1897, at St John’s Church, Dewsbury Moor, 21 year-old, Emma Hatfield married 22 year-old miner, George Arthur Gooder. In 1901 George Arthur Gooder and Emma were living in St Matthew’s Parish, West Town, Dewsbury with their one month-old child, Winnie Gooder. In 1911 the couple were living together in the same parish with two children, Winnie now aged 10 years and Hilda aged 4 years, of the four children they had from their marriage. One of the four children had died before April 1911 and the other is likely to be Fred Gooder Hatfield, who was born a year before the marriage. For some reason, Fred Gooder Hatfield was living elsewhere at the time of the Census in 1901 and 1911. It is possible that he was being raised by his grandparents, Henry and Ann Hatfield, in West Town, Dewsbury where he was living in 1901 and 1911 and where, latterly, he was working as an errand boy aged 14. By 1913 George Arthur Gooder had moved to Station Road, Ossett and sometime later the family, now including Fred, moved to Dale Street, Ossett. The 8th Battalion Cameronians (Scottish Rifles) were based at Cathedral Street, in Glasgow with the Scottish Rifle Brigade, Lowland Division when war was declared in August 1914. They moved to Grangemouth for training and on the 11th of May 1915 the Scottish Rifle Brigade became 156th Brigade, 52nd (Lowland) Division. They sailed from Liverpool on the 24th of May 1915 for Gallipoli, via Egypt arriving on the 14th of June 1915. They were in action at Gully Ravine in late June and suffered heavy casualties, on the 1st of July 1915 the 8th Battalion temporarily merged with 7th Bn. (They resumed their own identity on the 21st of February 1916). In mid July 1915 they were in action at Achi Baba Nullah, and in late December at Krithia Nullahs. In January 1916 they moved to Egypt via Mudros and took over No 3 Section of the Suez Canal defences on the 2nd March 1916. They were in action in late April at Dueidar and in The Battle of Romani in early August, and during 1917 they were in action in the Palestine campaign. In March 1918 they left Arsuf for France and landed at Marseilles on the 17th of April 1918. Private Fred Gooder Hatfield was killed during the 52nd Division action at El Mughar, on the 13th November 1917, which was part of the wider battle of Junction Station, which saw the British capture the railway junction that linked the Turkish Seventh Army around Jerusalem with the Eighth Army on the coast. At 2.30 pm it was decided to try a cavalry attack on the position at El Mughar. The Turkish position was a ridge than ran north from the Wadi Mughar, with the village of El Mughar at the southern end of the ridge. It was a well chosen position, and the Turks were well entrenched on the ridge line, but barbed wire was in short supply, and the trenches at El Mughar were unwired. The attack was made by two cavalry regiments – the Buckinghamshire Yeomanry and the Dorset Yeomanry, supported by the Berkshire Battery of the Royal Horse Artillery, six machine guns, with the Berkshire Yeomanry in reserve and help from a field artillery brigade of the 52nd Division. The attack began at 3.00 pm. The attacking forces had to cross 3,000 yards of open ground, sloping up towards the ridge line. After trotting for the first 2,000 yards, the cavalry galloped across the last 1,000 yards, and soon gained their objectives on top of the hill. The long uphill advance took its toll on the cavalry horses, preventing a pursuit down the eastern side of the hill. Fred Gooder Hatfield’s army service record has not survived, but it is known that he enlisted in Dewsbury, and that his medal card records his Regiment as the Scottish Rifles with three service numbers: 40257, 2113 and 291630. "Ossett Soldier Dies From Wounds In Egypt - The sad news has come to hand that Private Fred Gooder Hatfield, of the Scottish Rifles, whose home was 4, Smith's-yard, Dale-street, Ossett, died from wounds on the 13th November in Egypt. Deceased, who was 21 years of age, joined the army about two years ago, and served about twelve months in France, where he was wounded. On recuperating he visited home, and then proceeded to the East. He used to work at Messrs. Wormald and Walker's mill at Thornhill Lees." Fred was posthumously awarded the British and Victory medals, but not the 1914/15 Star, indicating that he did not serve overseas before 31st December 1915. Above: Turkish Ottoman soldiers in Jerusalem in 1917. Private Fred Gooder Hatfield, aged 21 years, son of Mrs. Emma Gooder, of 4, Smiths Yard, Dale Street, Ossett, died on the 13th November 1917 and is remembered on Panel 25 at the Jerusalem Memorial,3 Israel and Palestine. The Jerusalem Memorial stands in Jerusalem War Cemetery, 4.5 kilometres north of the walled city and is situated on the neck of land at the north end of the Mount of Olives, to the west of Mount Scopus. 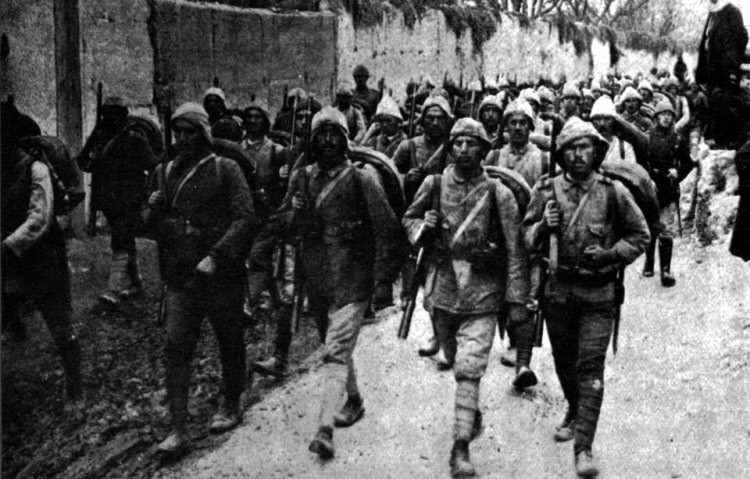 At the outbreak of the First World War, Palestine (now Israel) was part of the Turkish Empire and it was not entered by Allied forces until December 1916. The advance to Jerusalem took a further year, but from 1914 to December 1917, about 250 Commonwealth prisoners of war were buried in the German and Anglo-German cemeteries of the city. By 21 November 1917, the Egyptian Expeditionary Force had gained a line about five kilometres west of Jerusalem, but the city was deliberately spared bombardment and direct attack. Very severe fighting followed, lasting until the evening of 8 December, when the 53rd (Welsh) Division on the south, and the 60th (London) and 74th (Yeomanry) Divisions on the west, had captured all the city's prepared defences. Turkish forces left Jerusalem throughout that night and in the morning of 9 December, the Mayor came to the Allied lines with the Turkish Governor's letter of surrender. Jerusalem was occupied that day and on 11 December, General Allenby formally entered the city, followed by representatives of France and Italy. Jerusalem War Cemetery was begun after the occupation of the city, with 270 burials. It was later enlarged to take graves from the battlefields and smaller cemeteries in the neighbourhood. There are now 2,514 Commonwealth burials of the First World War in the cemetery, 100 of them unidentified. Within the cemetery stands the Jerusalem Memorial, commemorating 3,300 Commonwealth servicemen who died during the First World War in operations in Egypt or Palestine and who have no known grave.